Finebaum explained that it was easier for Auburn to bounce back after last years loss to LSU and win the West because they played Alabama and Georgia at home in Jordan-Hare Stadium. Those games will be on the road this season. On the other hand, LSU will get Alabama and Georgia at home in Tiger Stadium this year. "You don’t survive this and have much of a chance unless you start knocking people off.” wait, you have to win games to "have a chance"? Give this man a job at ESPN! So in summary, he thinks that LSU (with UGA and Bama at home this season) is incapable of doing what Auburn did last year. Might be why Ensminger is sleeping at the office this week. He is right. he could have explained it better, but he is right. No, Paul. Neither team is. Good lord, its the SEC opener. Finebaum is just saying ridiculous things to get attention. Nobody is "done in the SEC West" after the 1st game. They would almost certainly win the SEC-W if they win out and go 7-1 or would still have a realistic shot at winning the West at 6-2 as long as they beat Bama and just hope Bama trips up somewhere else along the way. This is so stupid. Was Auburn "done" last year after losing to us? I'll hang up and listen. And then you should keep reading, and apply logic. Sounds like a Auburn problem to me. Thanks genius! You mean just like last years loser who went to the SEC championship game? Reading comprehension. He also said auburn was able to overcome the loss to LSU by having their games against Alabama and Georgia at home and winning them. Those games will be on the road this year. But they're both home for us. So theoretically, we could do the exact same thing Auburn did last year. Chicken, please stop posting anything Paul Finebaum. He is just another agent of the Bama/SEC Network/ESPN machine. Doesn't deserve any visibility on this site. He is an enemy of LSU. 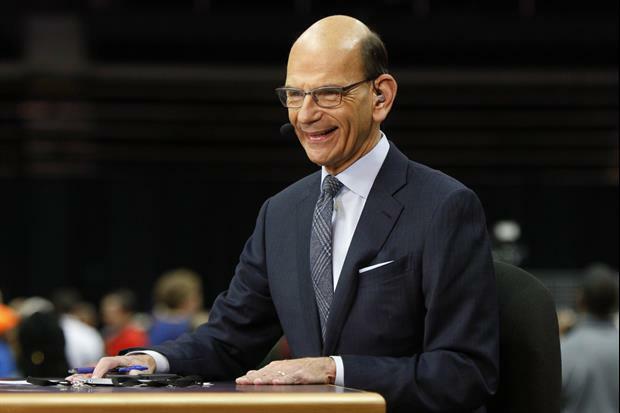 "Paul Finebaum: Loser" - stopped reading right there but I agree.